STOPPING off at Ma Foosies for an excellent cup of coffee and a snack in Richmond the other day when we caught up with our old mate Daniel White from Richmond on his way home from loading cars in Hobart. 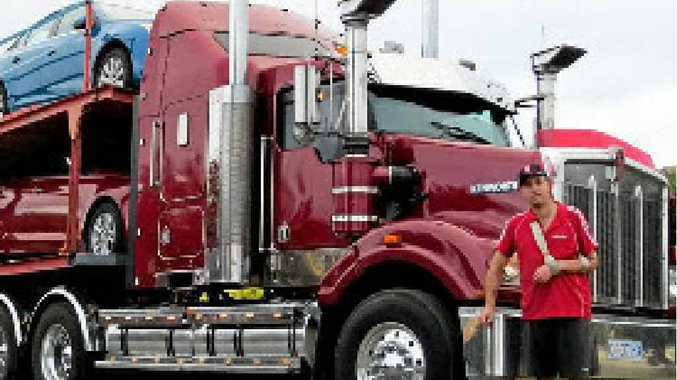 Daniel was driving his striking 2006 T-404 with a 500 Cat up front, and towing his father's fully loaded six-car carrier which he would be taking on to Devonport on the morrow for his father. He tells us he has had the truck for just four months, but so far he is loving it, and finding it comfortable. Our admiration for Daniel is immense surviving the horrific crash on the West Coast a couple of years back, and with extensive injuries, but never giving in, just keeping on battling. He told us his fiancee, "Chook" was working at the airport to earn spending money to keep the show on the road! Another operation coming up in July, what can we say, just keep on truckin' Daniel!